A haircut that is medium in length is very versatile. No matter how the hair is cut, it is both long and short enough for you to style it many different ways! Here are 36 different medium haircuts that you can mix and match to suit your facial features, style and personality. 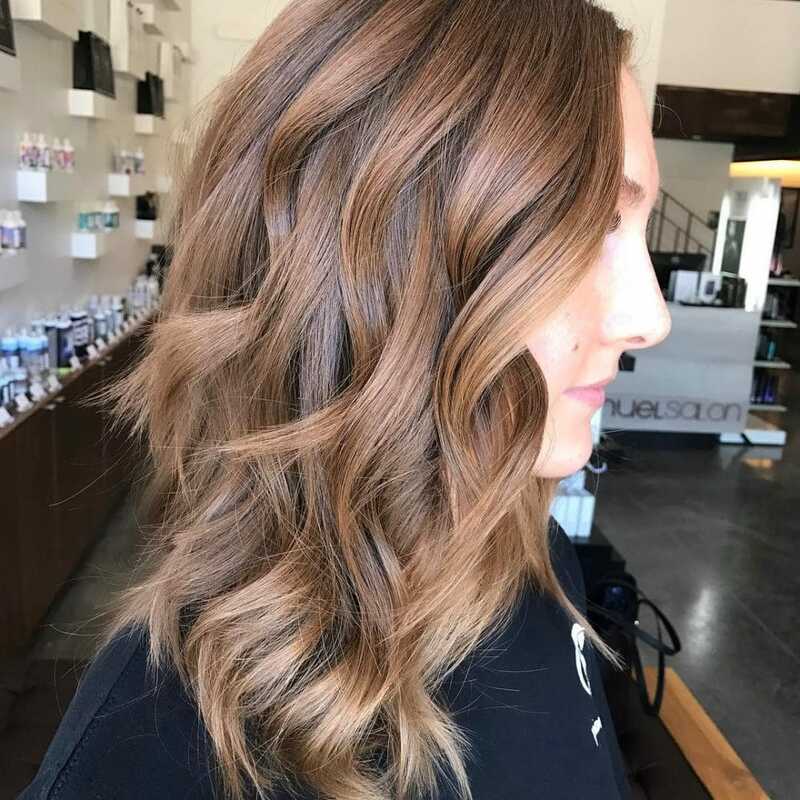 This trendy mid length style features a balayage, very lived-in color, meaning that you can wait a while between salon visits! Joico, It’s a 10, Puff Me products and the Amika Wand 1.25. 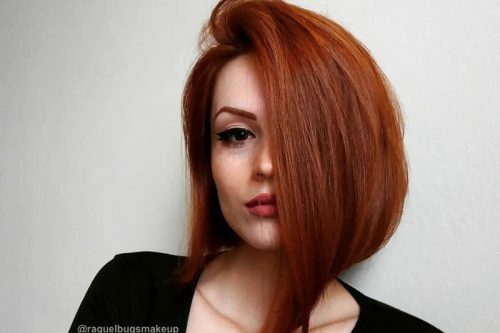 All face shapes and hair types can pull off this cut and color. If you are on a budget or don’t have time to go to the salon every six weeks, this low maintenance look is for you. 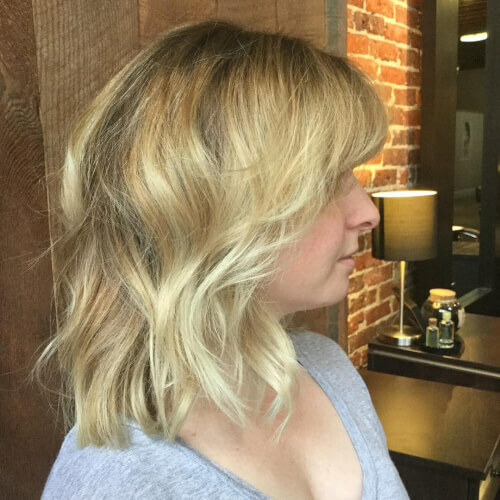 This mid-length blonde look is the first process of a color correction. If you take a peek at my Instagram account, you can see the before and after shot. I love color corrections because they are so challenging. You always have to adjust your plan along the way, which makes it exciting! I love that we got through the orange hues and entered into this nice shade of beautiful buttery blonde. 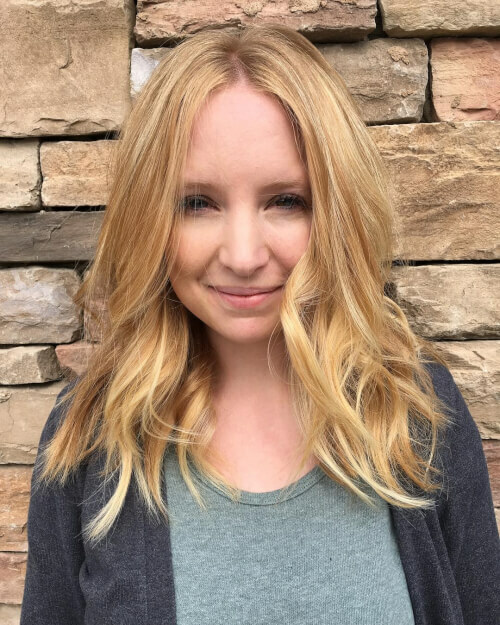 For the finished look, I prepped the hair with Aveda Damage Control and Aveda Phomollient. After drying, round brushing and beach waving, I finished the look with Aveda Air Control. 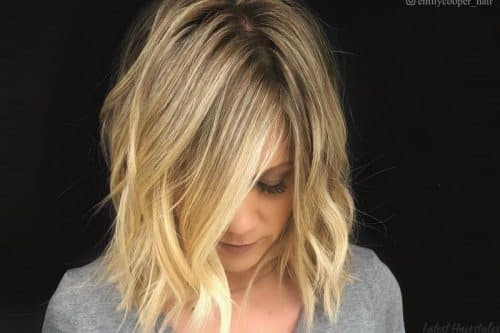 Textured haircuts and balayage team well together for a soft, undone and relaxed style for anyone that likes to stretch time in between appointments. This look is swingy, angle forward, shoulder-length long bob (lob), and I love the versatility of this look. You can wear this look straight, wavy, in a ponytail, half up, or braided. This length is the most versatile, in my opinion. To recreate this look, I recommend using a smoothing cream such as Kerastase Keratin Thermique along with a blow dry gel for control such as Kerastase Forme Fatale. I also used theKerastase Lacque Couture hairspray to set the finish and add shine. This haircut is suitable for MOST hair types, especially wavy or straight textures. 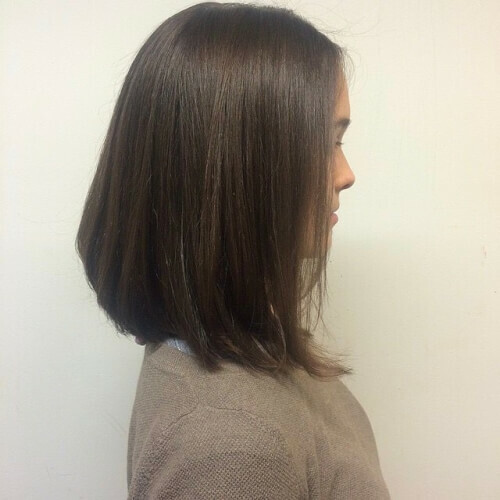 I would recommend this cut for all face shapes, but the length will vary depending on how long a person’s neck is. This style is great for women on the go with active lifestyles. It can be styled for multiple days with out shampooing. This blonde highlighted look took some time to achieve. We achieved this look over a three month period to save the integrity of her hair. She started out as a level 5 and wanted to be a blonde. She did not want a solid look, nor did she want to lose some of her depth. My favorite thing about this look is the dimension and tones. I used Wella Blondor using 20, 30, 40 vol as well as Higher & Higher with Olaplaex and Redken Shades 9N, 9V, 9T. I started out with a full highlight (first session) with Blondor, Olaplex and 30, and toned with 9V. Next session was highlighted with Blondor, Olaplex and 30 vol and pulled through some areas with Blondor and 20 vol., then toned with 9N and 9V. The third session was a full balayage using Blondor and 40 vol in the back with 20 on the ends, along with Olaplex. I then used Blondor with Higher & Higher in the front with Olaplex and 20 vol on ends with Olaplex. All of this was applied with a chip brush then put under heat for 10 to 15 minutes. I then rinsed and toned with 9t and 9V. I recommend using Hydrate Me Wash and Hydrate Me Rinse by Kevin Murphy to maintain this color. I would recommend this multi-dimensional highlight and cut for thick to medium hair densities (preferably coarse). 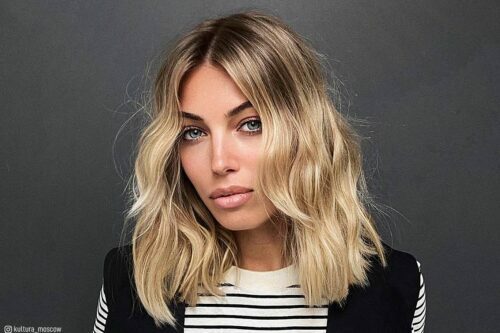 I also recommend this look for someone who likes do a light touch with a straightening iron or large round brush and likes a tousled, beachy look! 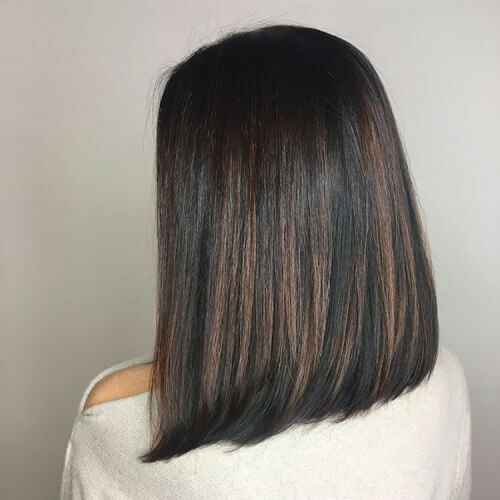 I love this mid-length, textured haircut with balayaged highlights. What I love about the color is that it enhances her already beautiful strawberry blonde by lifting it up and creating dimension. The color looks as though she spent all summer at the beach. 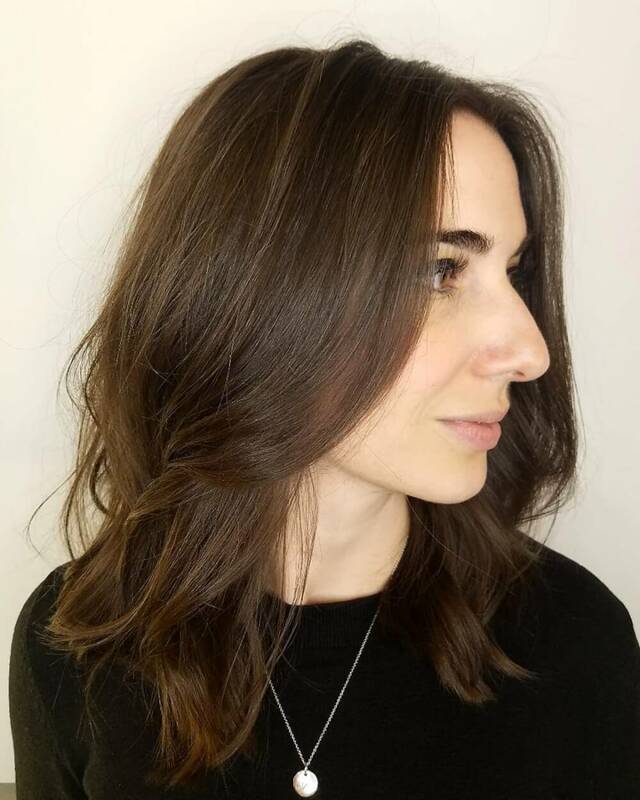 We modernized her cut by bringing up the length to the collarbone and created lots of vertical layers and texture to create a lived-in, not too perfect look. It’s the perfect combination of sass and class! I’m a L’Oréal girl through and through. This look was styled out with flat iron waves and products from the L’Oréal Techni Art line. First blow dry in Techni Art Volume Mousse to create lift at the roots. Once dried with fingers to enhance texture, go in with a flat iron. Hold the iron vertically start the curl close to the root and leave the ends out for a beachy finish. Spray with Techni Art Next Day Hair texturizing spray, separate waves with fingers, then flip the head upside down and shake out. Lastly, sprinkle Techni Art True Grip Texturizing styling powder for volume in the crown and that pieced out texture! This style is honestly suitable for almost anyone! The mid-length collarbone cut is great because you still can style it like you would long hair (i.e. 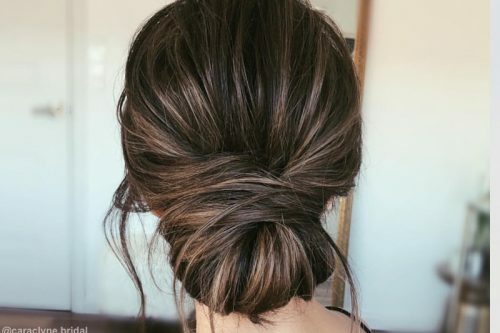 a topknot, ponytail or braids), but you are not weighed down with excess length. 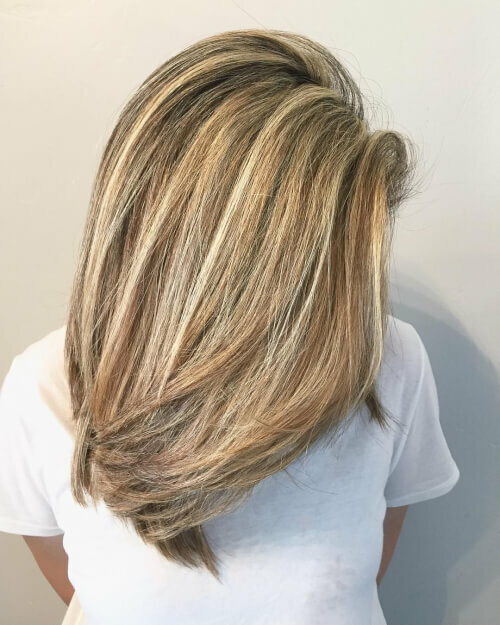 Balayage is so great for the women on the go! It is the ideal color option for someone that can’t be in the salon every six to eight weeks for maintenance. I especially love this look for moms! They can just come in every three to four months for a refresh and the highlights just evolve as time goes on. 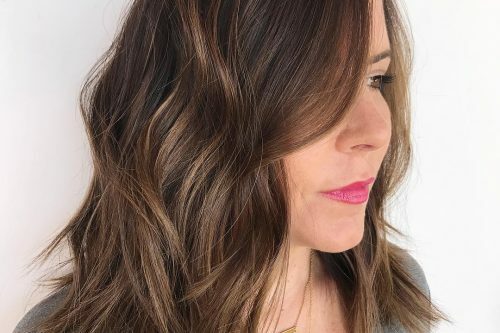 This look is called a “lob” or a long bob. It is great for those who love the idea of a bob but aren’t willing to go as short as a standard bob. I love this look because it gives you movement and sassiness while maintaining the client’s length. I’ve loved Verb’s glossing spray as long as I’ve been doing hair. It is the first spray that glosses while moisturizing without making the hair greasy. It also helps to tame flyaways. I recommend this hairstyle for anyone with an oval, heart or oblong face shape. Any hair texture can wear this style, but the more density in the hair the more texturizing you may have to do. 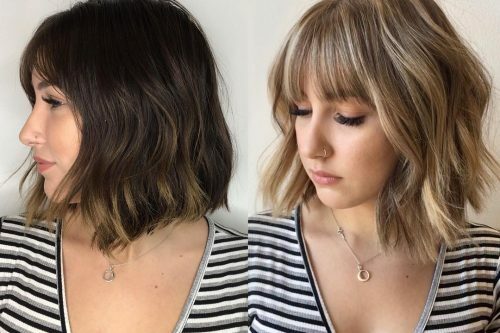 My favorite thing about this mid-length look is how I created texture with both the color and the cut, making it so fresh and messy. I definitely recommend a salt spray to create some texture and volume, and a shine spray to finish and give this look some sheen. This look is best for a client with fine (but lots of) hair that wants some texture and wants easier styling at home. This is the perfect haircut for an oval face because it softens the shape of the face. This is the best look for a young professional that wants an easy but smart look every day. 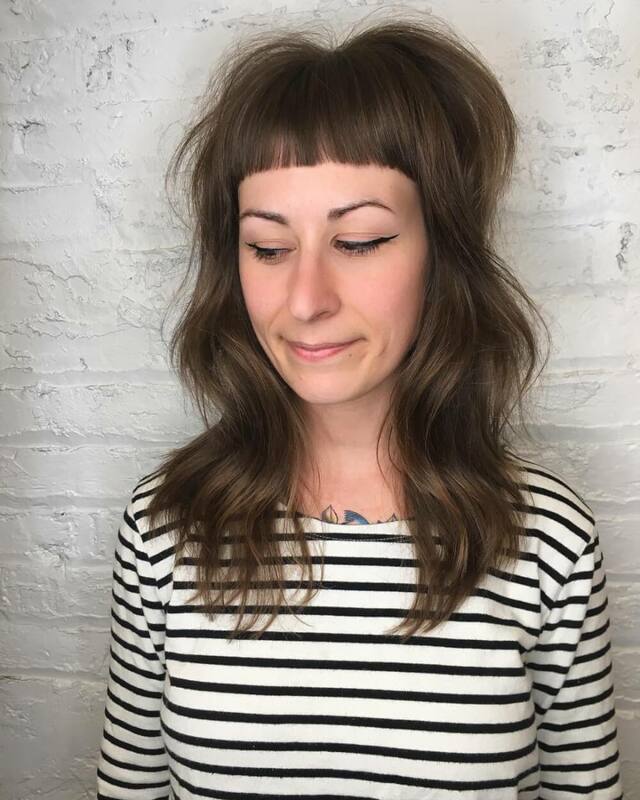 Stylist @ Immortal Beloved in Washington, D.C. I would describe this look as a modern shag. My favorite thing about it is how much body, movement and wave it gives the hair. To create this look, I would recommend a few different methods depending on your hair texture. If you have naturally wavy hair (not too curly and not too straight), grab some salt spray or beach spray and diffuse it. Once dry, brush it out and run some Smooth Style Serum by Oribe through it to smooth the frizz and shape the waves. If you have very curly hair, blow it out straight with some body, then use a 1 1/2 to 2-inch curling iron to add some big waves. You can also brush it out at the end. If you have straight hair, just add waves with a curling iron and spray some of Oribe’s amazing Texturizing Spray at the end for more body. Or, if you don’t have time, this type of highly textured layered cut is great air dried and grows out amazingly! 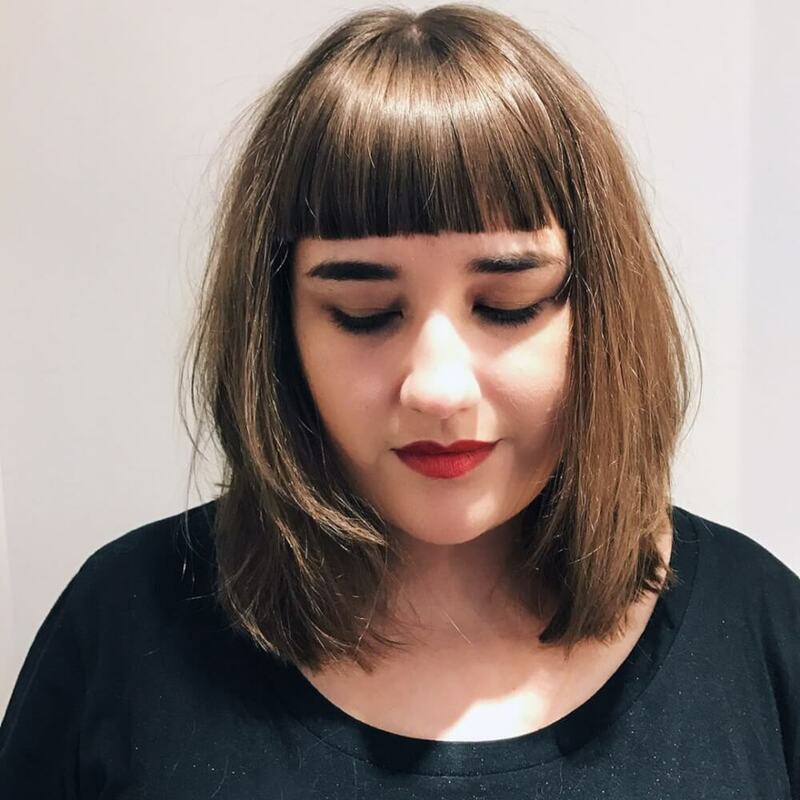 This cut is meant for anyone who wants a little more body and movement in their hair! It’s perfect if you already have a little wave in your hair and want to enhance it. 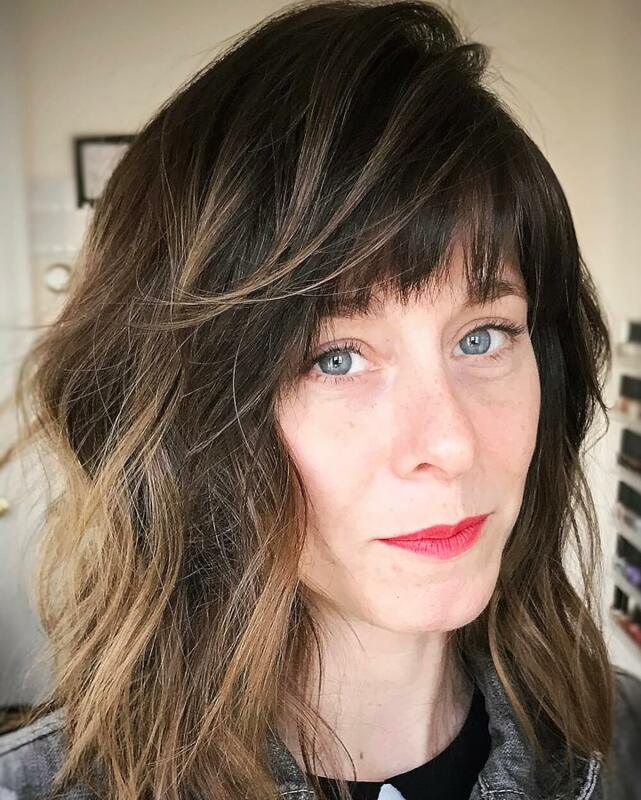 It’s more of a “rocker” kind of look and fits a very low maintenance lifestyle, but can also be primped up with lots of curls and texture spray for a more polished and fashionable look. 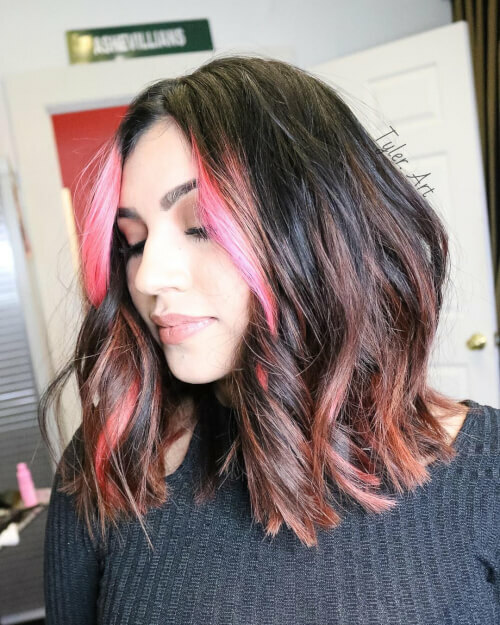 I would describe this look as a fun, abstract and shaggy long bob. My favorite thing about this look is the way I cut the layers. I section out an abstract star and use twist cutting to cut the layers. This look is really for anyone. You can air dry or blow dry this style. The cool thing is that it can be tailored to anyone’s face shape and hair type. We chose to do a more disconnected version to make her hair appear thicker and fuller. 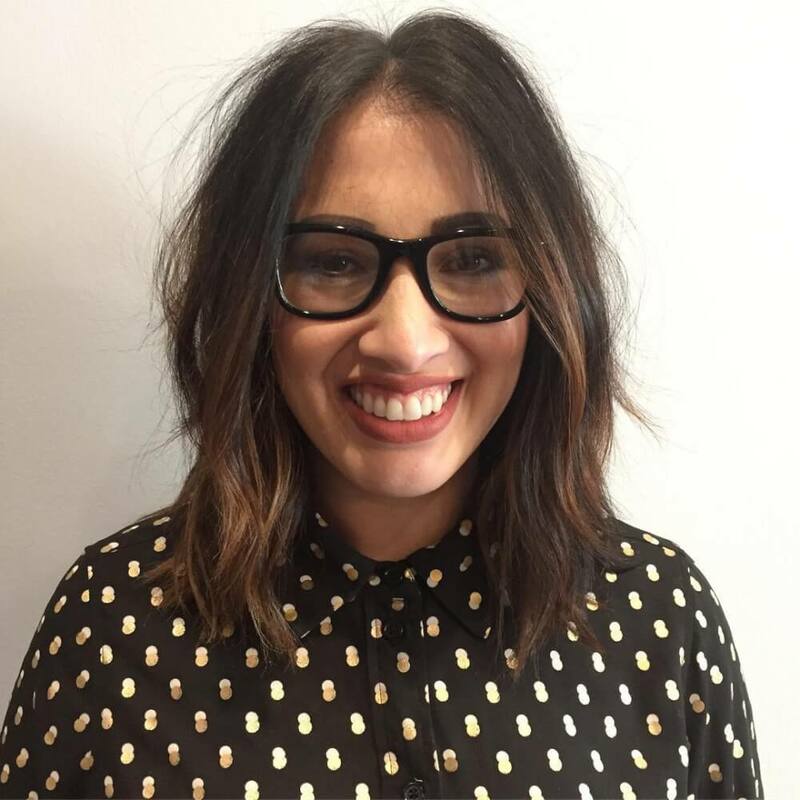 This cut and style is described as a modern midlength cut with soft, effortless curls. I cut down the center and created layers for softness around the face, then added a few long layers for movement and side cut for texture. The hair was rough dried 80%, then smoothed out with a brush. The look was finished by curling one-inch sections, alternating in and out. What I love most about this look is that it is effortless and therefore does not require much styling. I like to use Oribe Smoothing Cream to smooth out the hair from wet to dry. Apply Oribe Heat Protectant before using the curling iron. Finish the look with with Oribe Texture Spray and run fingers through the hair for separation. The beauty of the this look is that anyone of any age group or lifestyle can pull it off. It works with almost any hair type, but especially well with a natural wave. For this particular client who has an oval shaped face, we parted it down the center. It can also be worn on the side as there is no wrong way to style this look. Just have fun with it! 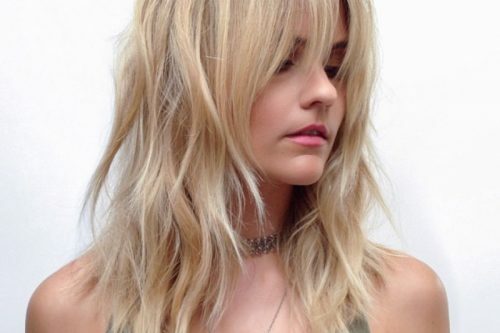 I describe this look as an A-line mid-length cut with some long layers that is blow dried into beachy waves. Considering we took the length up quite a bit, I love that it’s nice and light for summer. 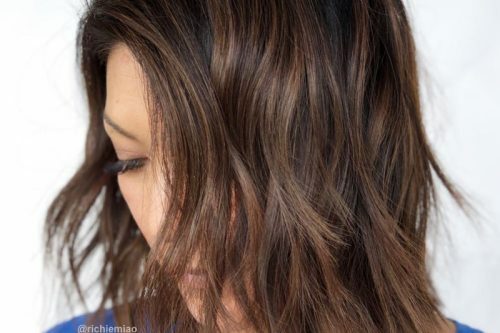 To create this look, I used Arrojo’s Wave Mist and Primp Working Spray and recommend them to recreate this look at home. They give just enough hold and texture while leaving the hair soft. I recommend this look for anyone! It’s an easy hairstyle to maintain whether the client plans on styling their hair or they’re more of a wash and go type. It’s light, easy, and perfect for summer. This look is cool, playful and effortless. It’s my take on a modern shag. 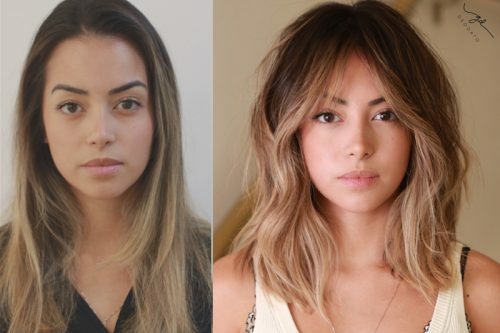 It’s great for anyone who’d like to switch up their look without removing length. I love how the layers make the hair look like it’s moving. My go to items for for recreating this look are a Hot Tools 1 1/4-inch curling iron and L’Oréal Next Day Spray. Curl dry hair in alternating directions, then break up the curls with you fingers and finish with L’Oréal Next Day Spray. 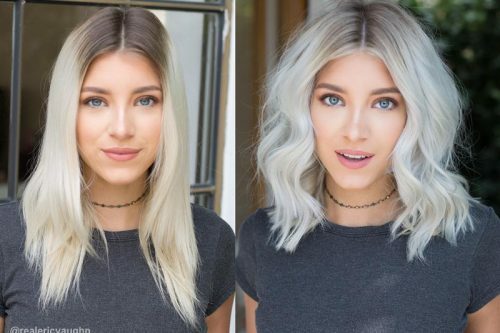 This look is great for anyone who is looking to change their hair without losing length (which, in my opinion, is like 90% of people). This look works on all hair types, and I love the variations this haircut takes on when spread across the hair texture spectrum. It looks so chic styled on fine hair and super cool air dried on curly hair. 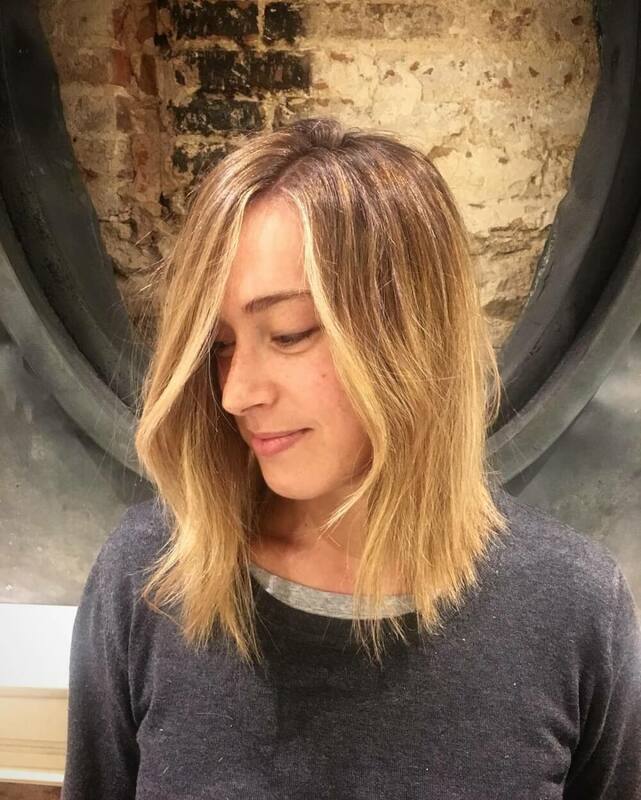 On this particular model, we were trying to get away from a long bob by breaking it up lots of texture and layers. This is a soft, mid-length, beach waved look that can quickly be done at home! Use a 1 1/4-inch barrel curling iron and curl in big sections. Curling away from your face and leaving the ends out is the key! Fingers are the best tools to pull these curls out after you let them cool down. To maintain this look, I would use Dry Texturizing Spray by Oribe. I can’t rave enough about this product. 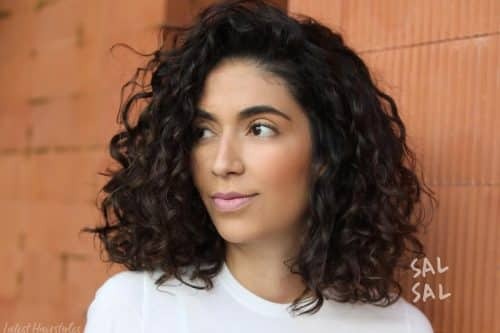 This is going to help maintain hold and separation in your curls. Also you can use it as a dry shampoo and for volume at the root. It also has a heat protectant in it! I would finish with an oil on the mids to ends for softness and shine. Gold Lust Oil from Oribe is my favorite. I think beach waves are the trend right now with long bobs and it’s gorgeous. However, I think these waves good on short bobs and long hair as well. I recommend this to anyone how hasn’t picked up the curling iron in awhile! It’s quick, realistic to recreate at home, and gorgeous. Who doesn’t want that?